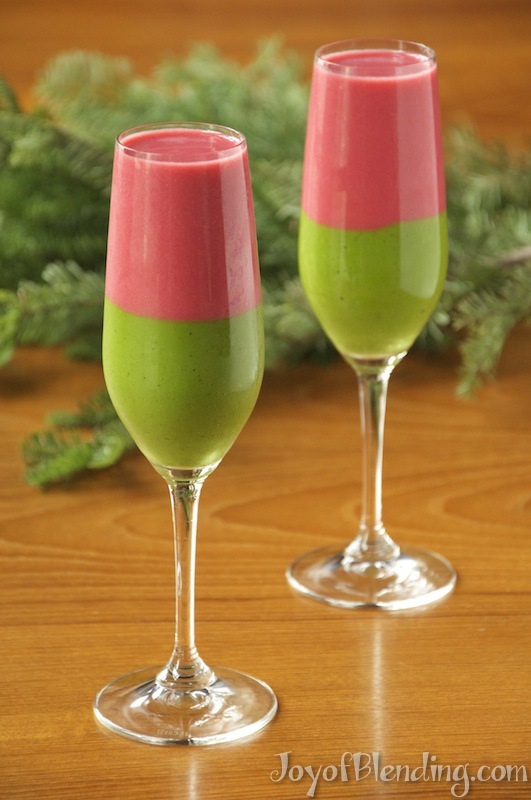 Here’s a festive two-layered Christmas smoothie recipe. Keeping the two layers separate is easy if you use a simple trick. 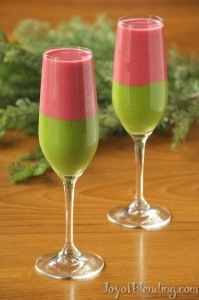 I tried to make a layered Christmas smoothie last year, but I didn’t use any tricks, and the layers mixed. You can use your choice of red and green smoothies, but I’ll share the recipes for the ones in the picture: the top is strawberry-pomegranate, and the bottom is mango-kiwi-spinach. It tastes good too! 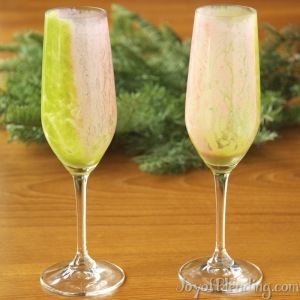 The layering trick is to briefly put the glasses in the freezer after pouring the first half. You don’t have to freeze it solid, just enough to freeze a thin layer over the top. This should happen quickly (5–10 min) if you make a cold smoothie, which I did by using frozen mango. Then you can pour in the top layer with no mixing. Rinse container, and make the second smoothie. I used the pomegranate whacking technique, and gave the pomegranate seeds a ~20 second head start in the blender. Then add strawberries and blend until smooth, ~50 seconds. The frozen strawberries made it very frozen, so I had to use the Vitamix tamper for a bit to get it to circulate. Then remove the glasses from the freezer and pour on the top layer. If, as you’re pouring, the top layer goes into the bottom layer, you can put the glasses back in the freezer to firm up. Serve, admire your handiwork, and enjoy! After my failed two-layer Christmas smoothie last year, this year I decided to look around the web for a better technique. (Last year I just gently poured the top layer, and it went straight down into the middle of the bottom layer.) I found a list of layered smoothie recipes, and from those there were three main techniques. The freezer trick seemed easiest, and it worked great, so that’s what I described above. The second technique is to carefully spoon the second layer on top of the first. However, a lot of the spooning recipes do not have as clean of a division between the layers, and it seems like more work. The third technique seems to be the most work, but it looks like if you’re careful, you can get a nice result. Over on Project Denneler, Sandra used squeeze bottles instead of a spoon to carefully make up to 7 layers. I suspect that you need two very thick smoothies for this technique to work. However you do it, enjoy the colors, and Merry Christmas! A technique (for non-vegetarians) for stabilizing bottom layer is good old Knox unflavored gelatin. Guess you could use Jello but who wants to contaminate a healthy smoothie with the stuff it has! 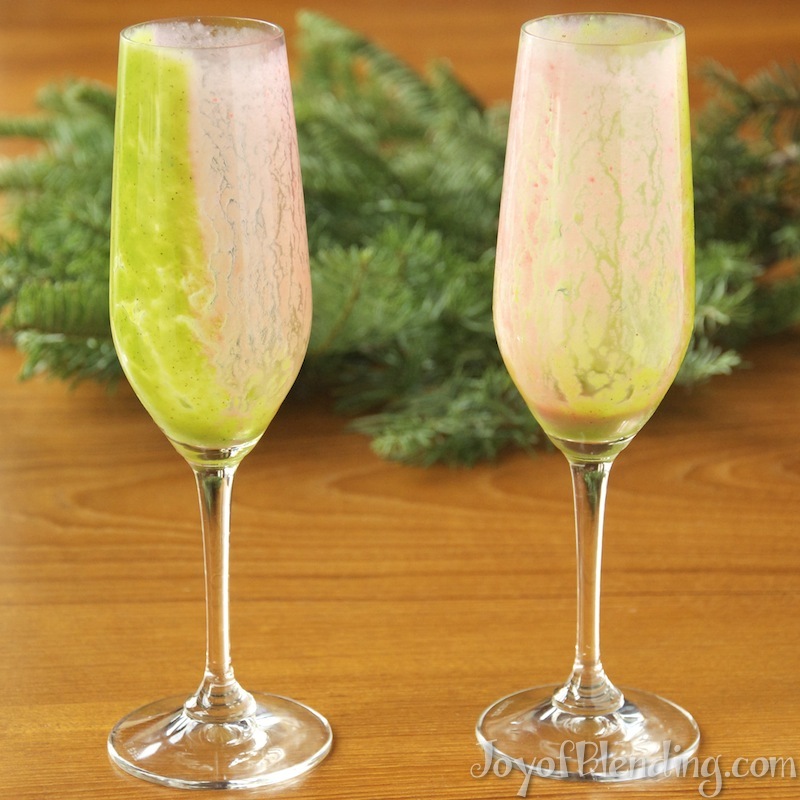 Dissolve gelatin (there are other unflavored brands besides Knox) in choice of liquid, then mix into bottom layer before pouring into glasses. It might take a bit of experimentation to find the proportion of gelatin to a given quantity of smoothie to gel just enough, but not become rubbery. I haven’t done a lot with stabilizing food with gelatin, so if anyone else out there has more definitive info about the quantity of gelatin to use, please chime in. I’m sure you could use gelatin, but I don’t think it’s necessary. The combination of a slightly thick smoothie and the freezer trick makes the layers perfectly stable.